The Director’s Screen project is an initiative launched in 2008. A collaboration of Extra Virgin with Pop Pictures, SF Cinema City and the film community, the project aims to create a new theatrical distribution outlet serving as a venue for showcasing the best and the brightest in independent and arthouse cinema from Thailand as well as around the world in an exclusive release at SF World Cinema, 7th floor CentralWorld. The project’s official launch took place in May 2008 with the releases of 2 Thai films. A debut feature by veteran shorts and music video director Aditya Assarat, WONDERFUL TOWN is the first feature film from Thailand to win the prestigious New Currents Award from the 2007 Pusan International Film Festival as well as the VPRO Tiger Award from the International Film Festival Rotterdam 2008, as well as a number of accolades from various festivals. An international critical acclaim, the film has been released in more than 10 territories worldwide. 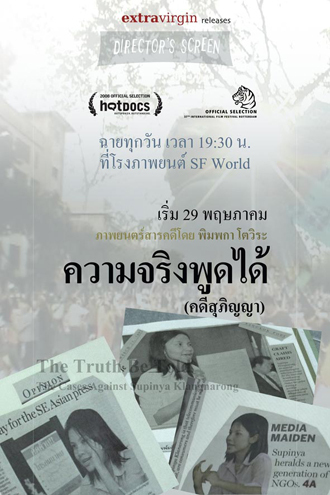 Another film in the line-up, the second feature from Pimpaka Towira is the documentary THE TRUTH BE TOLD: THE CASES AGAINST SUPINYA KLANGNARONG. Chronicling the life of Supinya Klangnarong, the Secretary-General of the Campaign for Popular Media Reform (CPMR), who in 2004 faced a huge defamation lawsuit from Shin Corporation – at the time belonging to the family of former Thai Prime Minister Thaksin Shinawatra, the film takes a deep look at the recent changes and development in Thai politics and society over the past few years, from the Thaksin administration to the 2006 coup d’?tat, as well as its aftermath. Both films hadan exclusive release only at SF World, screening everyday at 7:30PM in a 4-week run each. 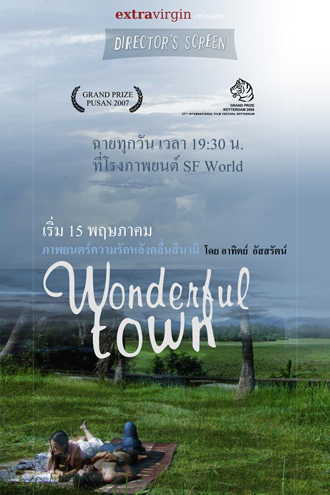 Wonderful Town is set for the 15 May release, followed by The Truth Be Told on 29 May. During the course of the theatrical run, there will be special activities organized for audiences to meet with the filmmakers and cast & crew of both films. More titles in the Director’s Screen project will be announced at a later stage.